My kids are obsessed with those plug-in room deodorizers and candles. But I can’t stand the smell of most of them – they’re too strong and fake. But what I do love is the smell of essential oils. 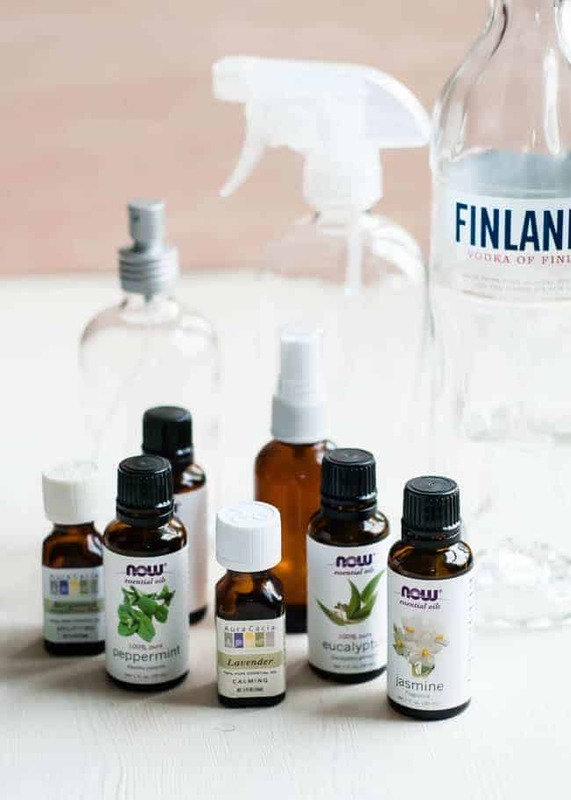 It’s easy as can be to make your own essential oil room sprays with three simple ingredients – water, alcohol, and essential oils. You can spritz it anywhere that needs a bit of freshening – bathroom, kitchen, laundry room, closets, anywhere! You can make the scent as strong or light as you want by altering the amount of essential oil. I’m partial to orange and jasmine because it reminds me of Hawaii (not a bad thing!). 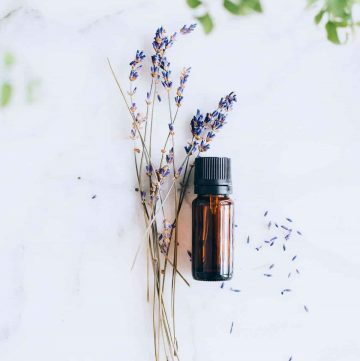 Peppermint, lavender, lemon, bergamot, cinnamon, rose and rosemary are very nice too, but you can use just about any essential oil you combination you like. I like to spritz different blends according to my mood, time of year or day. The vodka is essential for the spray. Oil and water don’t mix, but adding a little alcohol fixes that. It disperses the oil and also helps the scent linger longer in the air. You still should shake the bottle of room spray a bit before you spritz so that the essential oil is evenly distributed in the liquid. I reuse or purchase little glass spritzer or spray bottles for the room spray. I get mine at the health food store or online. 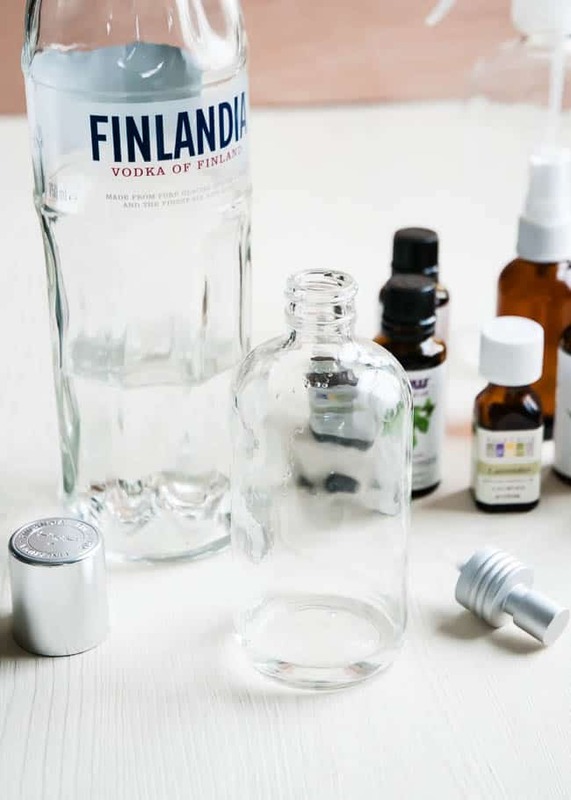 Place the alcohol into a small spray bottle. Add the desired drops of essential oils. Shake well and add the water. Shake again and spritz whenever you need a little pick-me-up. Do you use air fresheners? What’s your favorite scent? Is there a substitute for the vodka if you can’t have alcohol in the house? I have the same question. Could household rubbing alcohol be used? Why vodka? I don’t use alcohol and buying a bottle of vodka for one tablespoon wouldn’t be cost effective for me either. You can buy oil dispersers from aromatherapy suppliers. I think Mountain Rose Herbs probably does one. I was planning on getting one of those little airplane bottles so I’m not stuck with a bottle of vodka that will go to waste. You can use a distillate or make your own. In the bottom of a 4 qt pot or larger- invert a small bowl set a bowl on top to catch the distilled water. Use some herbs and water on the bottom to infuse the distilled water with plant material. Invert the lid of the pot and turn the pot on low. Hopefully your pot lid will be angled slightly and you can put some ice cubes in it. The water that drips into the bowl will be distilled and will not go bad as fast but keep it in the fridge anyway. I use some lemon balm and lavender and spray it on myself after working in the garden. What a refreshment. You could definitely use ethyl alcohol. The scent of the alcohol will dissipate leaving the smell of the essential oils behind. Great question! I always seem to need energy when I’m in the office. Can’t wait to try the Focusing Office Blend! Is there a way to create a long-lasting air freshener using essential oils? Kinda like the plug-in versions or a jelly jar? Hi Sara! Great question! I think the best way to do that is to buy reeds and make a diffuser with it. Something like 1/2 cup of a carrier oil (avocado, olive oil, almond, etc) plus anywhere from 25-50 drops of essential oil should do the trick. Well, the method to make natural air freshener, using essential oils is truly wonderful. Most of the times, it is seen that people prefer perfumed candles than buying a natural room freshener. Perfumed candles help to uplift the mood of the surrounding. LOVE this brand essential oils, I am so going to have to try this vs. buying it already made! I don’t like using alcohol – wouldn’t witch hazel work just as well? I haven’t tried that, but I don’t see why not. Let me know if you try it! I just skip the alcohol. It doesn’t seem to matter. I love spraying my home made air fresheners! Hello, where to get the same spray bottle which is in the picture? I bought that online from rail19.com. I buy my spray bottles at the Dollar General, skip the vodka, use distilled water and YLEO Purification, which eliminates odors in seconds! I was eager to try this out, so I used an old glass bottle that once held white wine vinegar. Since it had a screw-top lid, a spray nozzle fit right on it! Great alternative to buying expensive glass bottles from the manufacturers. I know this is an odd question but is there any alternatives to vodka – I will not allow the stuff in my house. I’ve heard about using witch hazel but I’m not too keen on that either. Any ideas? 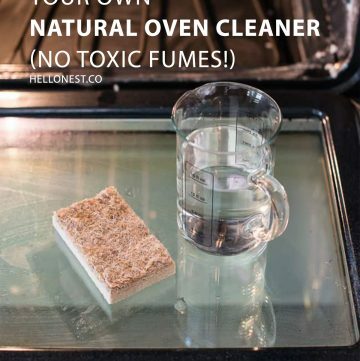 You could use rubbing alcohol or witch hazel without any trouble. What are the pros/cons of using alcohol vs.vodka? I think the scent/fumes from rubbing alcohol is the main con, otherwise, it’s about the same effect as the vodka. And it’s less expensive. I suggest you do a lot of research before spraying rubbing alcohol into the air and breathing it. It’s known to have many detrimental effects on the body. 4 drops of Four Thieves blend. Smells heavenly and an immune system boost. Adjust to your own liking. Where is a good place to buy vanilla EO? I would love to find a good source. Could you use real vanilla extract instead of alcohol since alcohol is apparently used to make that? I don’t have drinking alcohol in my house either. What good grade emulsifier do you use, please? If you have ceiling fans, you can use a blend with any carrier like grape-seed oil and rub some on top of the fan blades! It really smells wonderful . am new on the plate form,pls how can i make a ten litters of air freshner using vanila/lemon? I have tried many ways to increase the effect of the fregrance but to no avail,pls can you help me? This recipe is incredibly small……6 tablespoons of water? that will last me one day!!! any updates on a larger quantity recipe? Thank you! Just double, triple, etc the recipe. I have an 8oz spray bottle I’m going to multiply this recipe till its full. How long do the sprays last? And could they work with out the alchol at all? I want to start making my own to spray around as i cant stand those plug in things either! I’ve also got a bit hesitant of using shop bought smellies as I dont like the long list of chemicals in them! You can substitute witch hazel for the alcohol, using the same amount. I’m assuming vodka if using alcohol since it has the least amount of “scent”?? Thanks so much! I can’t wait to make these.i love the real smells over the strong fake ones. Thanks so much for the diy recipes. I’ve been looking for a bathroom mildew spray and this will certainly be used as I tackle my spring cleaning! Where did you find the bottles! When using essential oils it’s best to use Brown or a dark color bottle I buy all of mine thru Amazon they have all different sizes. The large ones I use for spraying around the house and also around the pool outside areas. The small one I use in the bathroom for air freshener. Hope this helps. Can you use rubbing alcohol? I wouldn’t either! For one, it smells horrible. Also, “real” Vodka (alcohol), the cheapest you can find, does the job and evaporates/dissipates into the air before it lands. 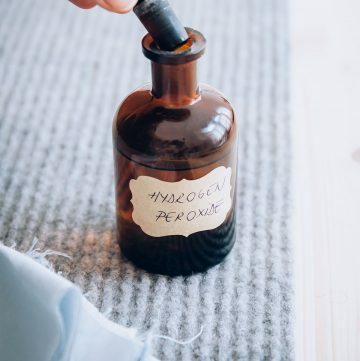 Isopropyl Alcohol (rubbing alcohol) might stain fabrics. Google: Why inhaling Rubbing Alcohol is bad for you. Also, isnt Witch Hazel predominantly isopropyl alcohol? There are options of witch hazel that are alcohol free. I read that the alcohol make the oil scent last longer. 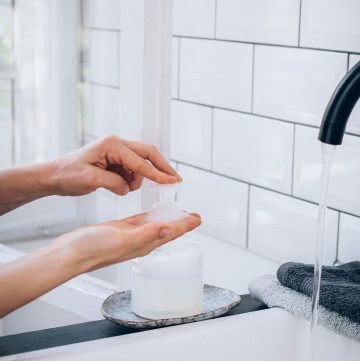 As for those mass chemical fragrances, Phthalates are the unlisted hormone disruptor that could be linked with many chronic illnesses and symptoms…”could be linked” but won’t be; because it wouldn’t be profitable. “Why phthalates are dangerous? Phthalates, a family of industrial chemicals used to soften PVC plastic and as solvents in cosmetics and other consumer products, can damage the liver, kidneys, lungs, and reproductive system — particularly the developing testes — according to animal studies.” -Google search It’s not just what we are inhaling, people are bathing in these chemicals with hundreds of body products and cosmetics. Imagine how much is consumed thru lip products?! In my home made sprays I use a very cheap vodka it dries quicker when sprayed on furniture or anything with cloth. Great recipe! I refill my air freshener sprayer with this, and I’m excited that it’s both natural/non-toxic as well as inexpensive. I am looking to make 8 bottles, about 1.5-2 oz. 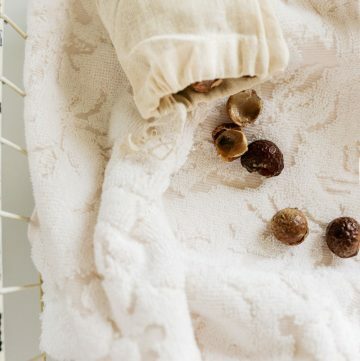 of room freshener…more of a clean linen scent. Any suggestions for the full recipe? Vodka alcohol, not rubbing alcohol. I’ve recently become obsessed with the smell of pink grapefruit essential oil, and I want my whole apartment to smell like it! Thanks for the recipe and tips, I decided to forgo alcohol and use witch hazel instead, and I quadrupled the recipe, and I love it! My whole apartment smells amazing now! I have tried to mix 15ml vodka with a few drops of essential oils and then added 15ml water to it. You wrote vodka acts as an emulsifier to mix the oils into the water, however it hasn’t mixed at all and the essential oils just swim on the top of the liquid!!! I am hugely surprised, do you know why this happened? Do you know how to get them to mix? Hmm…I’m not sure. I still shake it up before spritzing. Maybe try just using the oil and alcohol. When I mix essential oils, vodka and distilled water, I get a cloudy liquid. Why? It’s the essential oil. When shalen, the oil is separated into so many tiny drops, it appears cloudy. Same thing happens when yoi add water to absinthe. I know this is old but Vodka isn’t high enough proof to keep everything together. You’re going to want to use perfumers alcohol or something like everclear. If you’re looking for a natural spray using witch hazel instead of alcohol then feel free to contact me to find the perfect spray for you 🙂 ranging from calming pillow mists to help you sleep to energising sprays to get you going! Can you please send me some of your recipes. Hi there what is best spray to help me sleep can you please tell me ,? Hi there… I’ve been trying my Hand at room sprays. Using fragrance oils and a solution from essential wholesale labs that is “supposed to “ hold the scent . But, for me, not so much . Any suggestions? Should I try the vanilla? Vodka? Whatcha hazel? Maybe more FO? Desperate for help . Vanilla extract IS alcohol, but most people dont consider it alcohol. Substitute that for the vodka (and dollar store vanilla is cheaper than any vodka around anyway!). this is what I am wondering! Tap water varies from one location to another depending on the mineral content of the source water. Distilled water is a consistent product devoid of minerals because its derived from the steam of heated water. Distilled water is less likely to turn your humidifier or vaporizer slimy so it stands to reason that its also less like to breakdown in a spray bottle. I love having the scent of peppermint in the air when I’m doing my morning ritual. It helps keep my focused and on task so that I don’t miss my bus to work. I tried going without it but I always missed my bus! This is amazing. I love making things, especially natural ones and this would be just perfect. Definitely going to try it out. 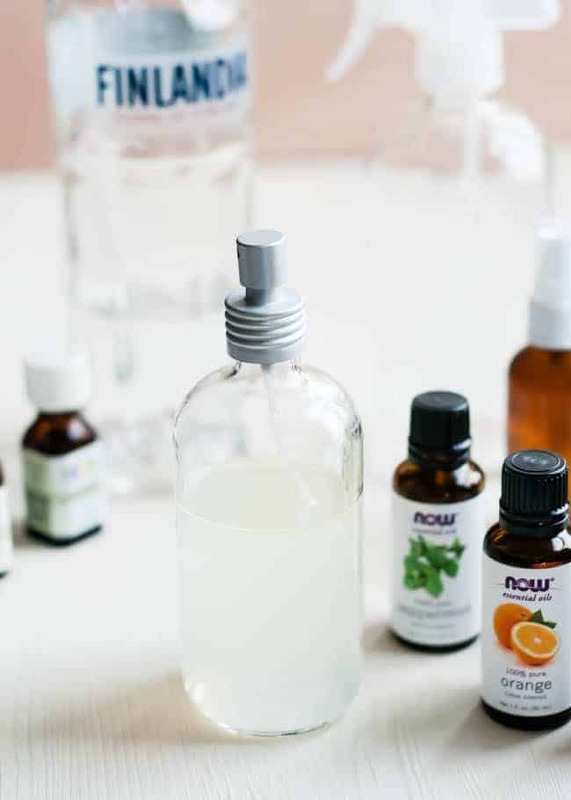 Well, this method – making natural air freshener, using essential oils is truly wonderful. This method so useful for me, Of course! Perfumed candles help to uplift the mood of the surrounding. And From this, I will feel happy in my work! Can I use gin instead of vodka? I just made it with lavender oil, it worked and its delicious!! Can you use a non glass bottle?